Share Your Love of Reading With Words Alive This May! A picture from last year's Share Your Love of Reading campaign! The VIP reader had students get up and dance! May is here, and that means it’s time to #ShareYourLoveofReading! You can make an impact on society just by sharing what you love to read and why. Reading is a vital skill to have, and one that isn’t as common as you might think. According to conservative estimates, approximately one-fifth of high school graduates are functionally illiterate. This means that while about 20% of our high school graduates may be able to read and write at basic levels, they cannot do so well enough to succeed easily in jobs or other day-to-day activities. This epidemic isn’t just affecting high schoolers. Problems with illiteracy start before elementary school does. According to a 2015 Department of Education report, six out of 10 kindergarten students enter their new classrooms unprepared. With this many students starting out with a disadvantage, it’s no wonder that about 40% of fourth graders aren’t reading up to grade level standards. This fourth grade number is especially significant, as this is when reading starts to be used to learn about other subjects, severely hampering those who struggle with reading in all other subjects going forward. This is why it is so important to #ShareYourLoveofReading! If you can make a mark on one mind, old or young, you're working to improve the state of literacy, and this effect can snowball. Kids often unintentionally push their classmates to do better in school by leading by example, and adults can push the children in their lives to pick up a book. Reading aloud is one of the keys to creating enthusiastic, skilled young readers. A University of Kansas study has concluded that consistently reading to children can increase their I.Q. test scores at age 3, as well as improving overall vocabulary and fluency of language. While talking to kids is still a great way to increase intelligence, reading is even better, as we tend to speak more lazily (and with more grammatical mishaps) when not reading from a page. In a survey run by Scholastic, a shocking 83% of kids said that they loved it or liked it a lot when their parents read aloud to them, while merely about 20% of children aged six to 11 said that they still get read to at home. Literacy is vital in all professions, even in jobs you might not expect. Those working in more physical occupations need to be functionally literate in order to safely operate equipment, follow detailed instructions correctly, and prevent workplace injuries by following safety manuals and regulations. Furthermore, engineers, scientists, and mathematicians all need to communicate their potentially game-changing ideas to their peers and all of the world, so neglecting reading due to an expertise in another subject isn’t a viable way to prepare for success in this other field. The bottom line is this: reading is important for everyone, not matter your occupation, and reading aloud to kids is one of the best ways to inspire a love of reading. These are the reasons why this May, for our #ShareYourLoveOfReading campaign, we are inviting very special "VIP" readers of varying professions into our elementary school classrooms to read to students! This will truly help drive home the message to young kids in our Read Aloud Program how important reading is and how fun it can be! A #shelfie from last year's Share Your Love of Reading campaign! The picture features a young baby surrounded by books! You're never too young to start reading! Take a #shelfie. Take a picture of yourself in front of your bookshelf or with your favorite book, post it on social media (while tagging #ShareYourLoveofReading and #Shelfie), and encourage your coworkers, friends, and family to do the same. This will help Words Alive get the word out about the importance of literacy, and maybe even inspire some fruitful, book-based discussions in your comment sections! 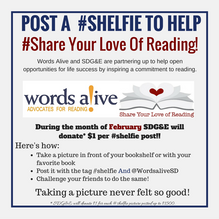 Don't forget to tag @WordsAliveSD in your post! Donate! Throughout May, we're looking to increase our number of sustaining donors! Monthly donations provide consistent funding for our programs that we can count on. For as little as $5 a month you can sponsor a new set of books for a classroom! Find out more here. Keep following those hashtags! Words Alive will be bringing in some surprise VIP readers to read aloud to classrooms in the San Diego area. We'll also be posting images of our incredible Board, Staff, and volunteers throughout the month, with quotes explaining why reading is important to them! Sharing these images will help to spread awareness about the importance of literacy. Volunteer! Words Alive is always looking for those willing to work towards improving literacy in San Diego. Check out your options here. We can't wait to see how you #ShareYourLoveOfReading this May!